To perform Cross Datacenter Replication (XDCR), you start by creating a reference to the remote cluster and bucket that will receive the replicated data. The name of the remote cluster. The IP address or hostname of a node within the remote cluster. A username and password, associated on the remote cluster with a role that provides XDCR management-privileges. The possible roles are Full, Cluster, and XDCR Administrator. 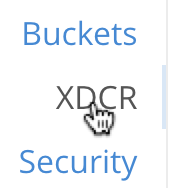 Note that the administrator setting up XDCR must also have one of these roles on the local cluster. Whether the the connection between source and target clusters will be managed securely, and if so, by what secure methodology. Corresponding TLS certificates may need to be provided. Securing a connection is described in detail in Secure a Replication. Once the reference has been saved, it can be used to specify a target cluster, when an XDCR replication is created. Each cluster contains a single bucket, which is the travel-sample bucket. To access and install this, see Sample Buckets. That you have the ability to create a target bucket to which data will be replicated. The examples on this page use the travel-sample bucket, whose installation is described in Sample Buckets. For information on listing and creating additional buckets, see Manage Buckets. The lower part of the main panel is entitled Remote Clusters. 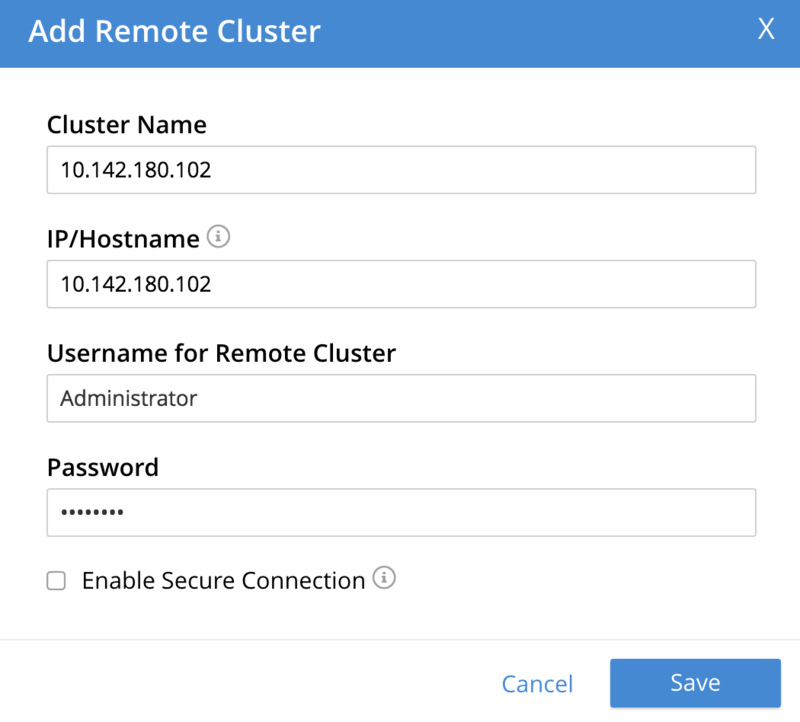 The list, which is designed to show the name and IP address or hostname of each registered remote cluster, is currently empty, and so bears the notification No cluster references defined. Define a reference, by left-clicking on the Add Remote Cluster button, at the upper right. The fields in this dialog are explained above, in Understanding References. When you have entered the data, left-click on the Save button. 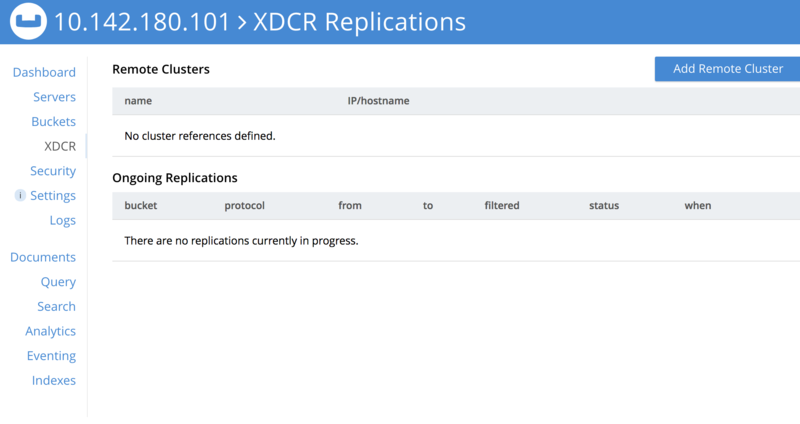 The XDCR Replications screen is again displayed. The Remote Clusters panel now contains the reference you have defined. By left-clicking on the Edit and Delete options, provided on the row for each defined reference, you can respectively edit (by means of the Edit Remote Cluster dialog, which is identical to the Add Remote Cluster dialog) and delete defined references. Note that if a reference is already associated with a replication, you cannot delete the reference; nor can you modify its target IP address. However, you can change the registered name of the target cluster, and you can change the security settings for the replication. The following is returned. Note the uuid associated with the reference, which will be used later in the current section. For more information, see the complete reference for the xdcr-setup command, which includes details on how to edit an existing reference. For more information on the REST APIs remoteClusters method, see the detailed reference pages on setting and getting references. Once a reference to a target cluster has been defined, you can Create a Replication.